Can't find your size or color? We can get it! If you're tired of being poked in the belly by your saddle horn, but you're not ready to give up a horn, check out the Tucker Trail Head. The short 2" horn provides the perfect solution - the security and stability of a horn without the threat of personal damage. The shock absorbing seat with 3.5" cantle means you will be comfortable as long as you're in the saddle. And so will your horse with Tucker's ingenious Tri-Tech Fit System. After more than 35 years of perfecting ultimate trail comfort, the Tucker trail saddle has evolved into the most advanced equine riding system available today. 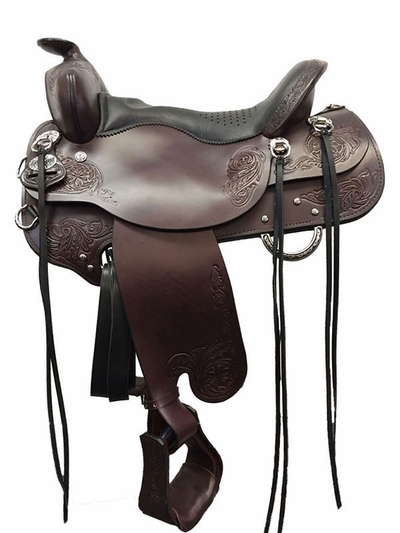 It's more than a saddle - its the Horizon sears by Tucker! This Standard saddle features an ergonomic shock absorbing seat and has the most advanced saddle tree system. The English bridle leather is beautifully hand crafted and has a stunning design. Seat: 15.5" 16.5" 17.5" 18.5"